Hanover Chapel was built in 1825 on a plot of land bordered by Church Street and North Road. The site already formed a burial ground which may have been in use since the 1700’s although many aspects of this period are unclear. 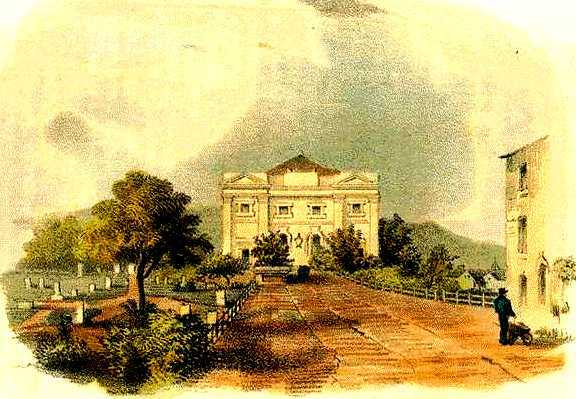 Built as an Independent chapel it saw use as a Presbyterian Church from 1844 and in 1845 Queen’s Road was constructed over the western side of the burial ground. The original boundary wall and railing remain on the western side of Queen’s Road as a raised pavement. Like St Nicholas Ground, burials largely ceased at this site in the early 1850’s and the churchyard was subsequently laid out as a public garden. In 1949 the headstones and monuments around the burial ground were cleared, many placed around the site perimeter. The inscription records (below) were taken at the start of this process and describe the monuments before they were cleared. Use by Presbyterians continued until 1972 and the chapel was then used as a Greek church until 1978. The church hall became a community resource centre in the late 1970’s, and a warren of burial vaults and crypts beneath the building became band rehearsal and performance space, disturbing and dislodging remains of those remembered. The church hall was destroyed by fire in 1980. In 1987 the remade church which retained the original southern facade with twin porches, Tuscan columns and giant pilasters reopened as the Brighthelm Church and Community Centre and in 1989 the former burial ground was remodelled with access from Queen’s Road. In this state it may be found today. The records below show the names which could be identified from headstone inscriptions in 1949. Many of the inscripted pieces will no longer be legible and many will no longer be on site folowing the clearances which took place at this time. The records were transcribed from copies held at the Brighton History Centre.